Are you thinking of buying a solar electric system for your home or business? Solar electric systems, which are also called photovoltaic or PV systems, are reliable and pollution-free. They make use of a renewable source of energy—the sun. And PV systems for homes and businesses are becoming more affordable all the time. PV works best in energy-efficient building. So, adding insulation and energy-efficient lighting, appliances, and windows is a good idea, to reduce your home’s overall electricity use before you install a PV system. To make PV systems even more affordable, some provinces offer financial incentives through solar rebates and other programs. Some utilities have net metering programs, which further enhance the economics of PV. Net metering means that when your PV system generates more power than you need, the excess goes to the utility grid, and the meter runs backward. This allows you to receive full retail value for the power that your PV system generates. A PV system can be a substantial investment. As with any investment, careful planning will help you make the right decisions for your home or business. Photovoltaic (PV) systems convert sunlight directly into electricity. They work any time the sun is shining, but more electricity is produced when the sunlight is more intense and strikes the PV modules directly (as when rays of sunlight are perpendicular to the PV modules). Unlike solar thermal systems for heating water, PV does not use the sun’s heat to make electricity. Instead, electrons freed by the interaction of sunlight with semiconductor materials in PV cells are captured in an electric current. PV allows you to produce electricity— without noise or air pollution—from a clean, renewable resource. A PV system never runs out of fuel, and it won’t increase oil imports. Many PV system components are manufactured right here in the North America. Batteries (optional) to provide energy storage or backup power in case of a power interruption or outage on the grid. AC electricity is compatible with the utility grid. It powers our lights, appliances, computers, and televisions. Select appliances that run directly on DC power are available, but they can be expensive. First, PV produces power intermittently because it works only when the sun is shining. This is not a problem for PV systems connected to the utility grid because any additional electricity required is automatically delivered to you by your utility. In the case of non-grid, or stand-alone, PV systems, batteries can be purchased to store energy for later use. Second, if you live near existing power lines, PV-generated electricity is usually more expensive than conventional utility-supplied electricity. Although PV now costs less than 1% of what it did in the 1970s, the amortized price over the life of the system is still about 25 cents per kilowatt-hour. This is double to quadruple what most people pay for electricity from their utilities. A solar rebate program and net metering can help make PV more affordable, but they can’t match today’s price for utility electricity in most cases. Finally, unlike the electricity you purchase monthly from a utility, PV power requires a high initial investment. This means that buying a PV system is like paying years of electric bills up front. Your monthly electric bills will go down, but the initial expense of PV may be significant. By financing your PV system, you can spread the cost over many years, and rebates can also lighten your financial load. Net Metering—In more than 35 states, customers who own PV systems can benefit from laws and regulations that require “net” electric meter reading. The customer is billed for the net electricity purchased from the utility over the entire billing period—that is, the difference between the electricity coming from the power grid and the electricity generated by the PV system. Through net metering, the customer obtains the full retail electricity rate—rather than the much lower wholesale rate—for kilowatt-hours of PV-produced electricity sent to the utility power grid. The benefits of net metering to consumers are especially significant in areas such as Hawaii and New York, which have high retail electric rates. Utilities also benefit because the solar-generated energy often coincides with their periods of “peak” demand for electricity. Why should you buy a PV system? 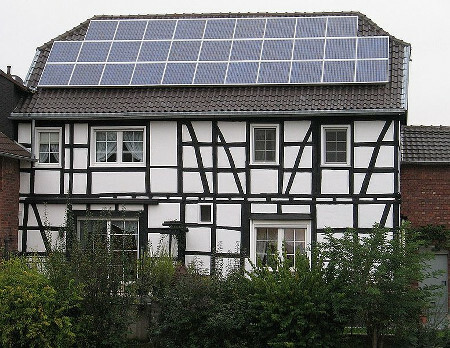 People decide to buy PV systems for a variety of reasons. Some people want to help preserve the Earth’s finite fossil-fuel resources and reduce air pollution. Others want to invest in an energy-producing improvements to their property. Some people like the security of reducing the amount of electricity they buy from their utility because it makes them less vulnerable to future price increases. And some people just appreciate the independence that a PV system provides. If you plan to build a home away from an established utility service, inquire about the cost of installing a utility line. Often, the cost of extending conventional power to your residence is higher than the expense of a solar option. Whatever your reason, solar energy is widely thought to be the energy source of choice for the future. Is your home or business a good place for a PV system? Can you locate your system, so it works well? A well-designed PV system needs clear and unobstructed access to the sun’s rays for most or all of the day, throughout the year. You can make an initial assessment yourself. If the location looks promising, your PV provider can determine whether your home or business can effectively use a PV system. If a rooftop can’t be used, your solar modules can also be placed on the ground, either on a fixed mount or a “tracking” mount that follows the sun to orient the PV modules. Other options (often used in multifamily or commercial applications) include mounting structures that create covered parking, or that provide shade as window awnings. be bright and sunny during certain times of the day but shaded during other times. Such shading may substantially reduce the amount of electricity that your system will produce. To be eligible for some rebates, your system must be unshaded between certain hours during certain times of the year. Some states have laws that establish your right to protect your solar access through the creation of a “solar easement.” Your PV provider can help you determine whether your site is suitable for a solar electric system. How big should your Photovoltaic Solar System system be, and what features should it have? To begin, consider what portion of your current electricity needs you would like your PV system to meet. For example, suppose that you would like to meet 50% of your electricity needs with your PV system. You could work with your PV provider to examine past electric bills and determine the size of the PV system required to achieve that goal. You can contact your utility and request the total electricity usage, measured in kilowatt-hours, for your household or business over the past 12 months (or consult your electric bills if you save them). Ask your PV provider how much your new PV system will produce per year (also measured in kilowatt-hours) and compare that number to your annual electricity usage (called demand) to get an idea of how much you will save. In the next section, we’ll pro- vide more information on estimating how much you will save. To qualify for net metering in some service territories, your PV system must have a peak generating capacity that is typically not more 10 kilo- watts (10,000 watts), although this peak may differ from place to place. Also, utilities have different provisions for buying excess electricity produced by your system on an annual basis. Finally, customers eligible for net metering vary from utility to utility; for example, net metering could be allowed for residential customers only, commercial customers only, or both. One optional feature to consider is a battery system to provide energy storage (for stand-alone systems) or backup power in case of a utility power outage (for grid-connected systems). Batteries add value to your system, but at an increased price. The value of your PV system’s electricity depends on how much you pay for electricity now and how much your utility will pay you for any excess power that you generate. If your utility offers net metering (and so pays the full retail price for your excess electricity), you and your utility will pay the same price for each other’s electricity. Actual energy production from your PV system will vary by up to 20% from these figures, depending on your geographic location, the angle and orientation of your system, the quality of the components, and the quality of the installation. electricity will not be worth as much as the electricity you use. You may earn only 2 cents per kilowatt-hour—or less than half the retail rate—for your excess power. PV systems produce most of their electricity during the middle of the day when residential electric loads tend to be small. If your utility does not offer net metering, you may want to size your system to avoid generating electricity significantly beyond your actual needs. How much does a Photovoltaic Solar System system cost? No single answer applies in every case. But a solar rebate and other incentives can always reduce the cost. Your price depends on a num- ber of factors, including whether your home is under construction and whether PV is integrated into the roof or mounted on top of an exist- ing roof. The price also depends on the PV system rating, manufacturer, retailer, and installer. The size of your system may be the most significant factor in any measurement of costs versus benefits. Small, single-PV-panel systems with built-in inverters that produce about 75 watts may cost around $900 installed or $12 per watt. These small systems offset only a small fraction of your electricity bill. A 2-kilowatt system that meets nearly all the needs of a very energy-efficient home could cost $16,000 to $20,000 installed, or $8 to $10 per watt. No one enjoy paying electricity bills and electricity bills is a larges expense in you house, Solar energy system is the best way to beat rising electricity bills. Solar system becomes a good solution which is kindly for the environment in cheap price. So do not need worry about the budget that we have to pay Solar application prepares the needs of the energy of solar for the home system,and of course for the industrial which needs a lot of energy.